EDINBURG — When starting right fielder Casey Danley went down to injury during the third game of the season, UTRGV coach Manny Mantrana began searching his roster for a fourth outfielder. Mantrana already had a plan for a new starter, but he needed to find depth, just in case of emergency. So, he sent sophomore shortstop Anthony Gomez into the outfield to catch a few fly balls during practice. Right away, Manatrana said, he could tell Gomez was a natural. Quite the contrary, Gomez doesn’t even remember the last time he played outfield. Maybe it was sixth grade, he said. Regardless, he’s found success in the role. 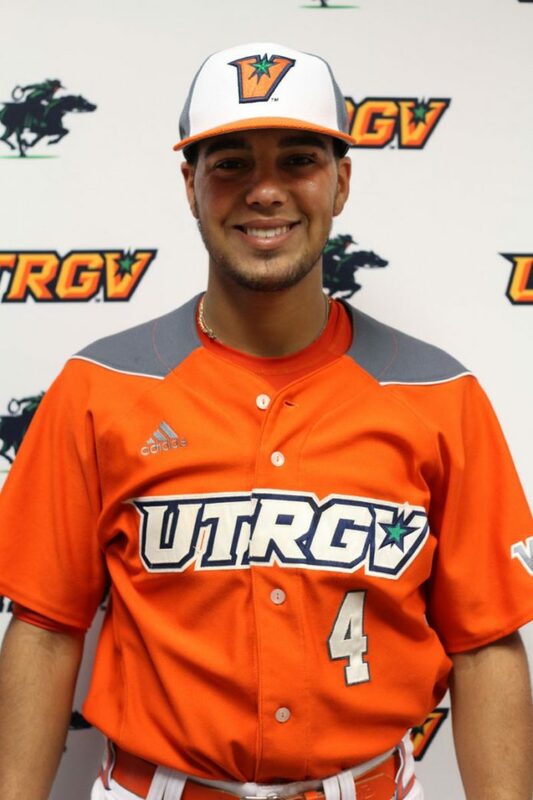 He went from the emergency option, to part of a platoon, to now starting UTRGV’s past eight games entering a matchup with Northern Colorado at 7 tonight at UTRGV Baseball Stadium. Along the way, the sophomore from Pembroke Pines, Florida, has raised his batting average from .218 last year to .326 this year — a figure that ranks second among the Vaqueros’ regulars. Gomez said he entered the program last year expecting to start and play a major role on the infield before hitting just .218 without an extra-base hit in 29 games, including 15 starts. Mantrana said the freshman needed time to adjust to Division I pitching and to develop strength in a college weightlifting program. Gomez added that getting consistent at-bats over the summer helped him immensely. He also said he worked with a personal trainer to become faster and even switched up little things like his pregame stretching routine. All the while, he’s continued to progress mentally. Gomez said he brings fire and “a little spice” to UTRGV. He’s also brought a .326 average, .438 slugging percentage, eight RBIs and 15 runs. In the outfield, he’s made two errors in 45 chances. Even during stretches when he’s gone a couple weeks between starts, Gomez said he never worried or wavered from his routine. Mantrana tells all his players before the season that they have to accept their role, and Gomez has always done so. All of the Vaqueros will be playing with extra purpose this week. Only six games remain in the regular season, and a berth in the WAC Tournament is still hanging in the balance. UTRGV (25-23, 6-12 WAC) is tied with Seattle U in the race for the sixth and final seed in the WAC Tournament. Northern Colorado (16-27, 5-13) is also in the hunt but ranks last out of eight postseason-eligible teams. Coming off an open weekend, Mantrana said his team is well aware of the stakes.